If you’re in Sri Lanka’s capital, Colombo, there’s only one place to start – Galle Face Green. The largest urban park in this jumbly city, it’s actually a cross between a park and a beach, the huge space also serving as an area for rallies, parties and, back in the old days, horse races. Nowadays it’s the go-to spot for sampling Sri Lanka’s tasty rainbow of street food, but back in 1859, its promenade was the brainchild of the British governor of what was then Ceylon, who thought delicate ladies needed somewhere to take the air and turned the previously fortified area into a green space. While Galle Face Green makes a great starting point, Sri Lanka seems to run on its stomach and short eats are never more than a tummy rumble away. On-the-go snacks are part of the national diet and cheap enough that everyone can fill up – you’ll be parting with pennies rather than pounds. After conducting a thorough sampling, I’ve come up with a list of what not to miss. Today the park is ringed with food vendor carts lit by small puddles of electric light, selling nuclear orange isso vadei – spicy lentil cakes that have prawns either mixed in or balanced on top. 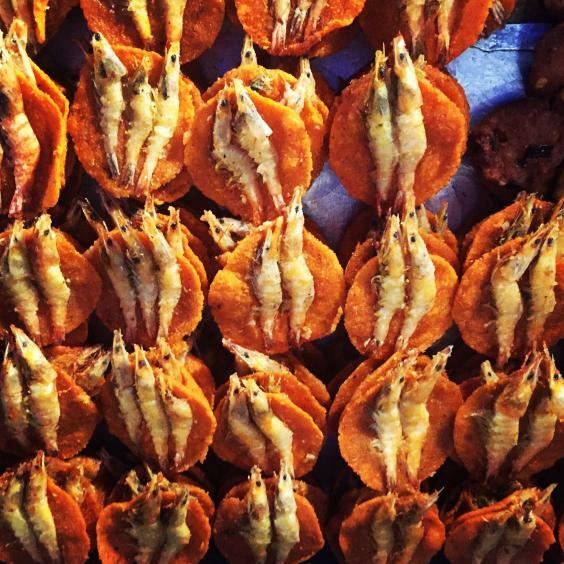 These after-work snacks lure Colombo’s residents down to the blustery seafront in all conditions. After trying a couple I’m not surprised, they’re strangely addictive things to pick at (if not so great to look at). A sort of Sri Lankan bubble and squeak, kottu was first made from curry leftovers – yesterday’s roti, vegetables, spices and meat or fish all mixed and chopped together. Nowadays, kottu has outstripped curry as the dish of choice and chefs bang and chop the ingredients together as though they work in a Japanese teppanyaki bar. 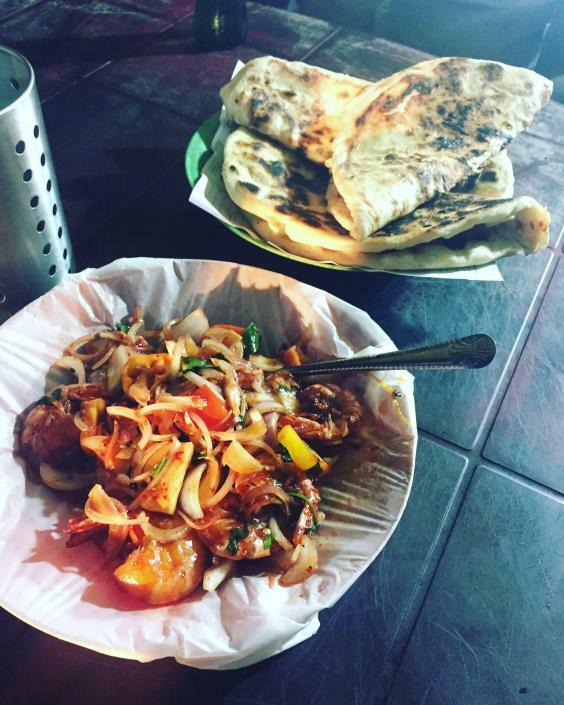 Nana’s, an informal group of open-air restaurants around Galle Face Green, is where the locals head for. At any of the Nana’s, cuttlefish, chicken or mutton kottu is served up on a bright plastic plate. 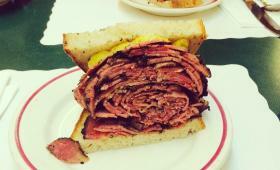 It’s a serious carb fest that almost demands a hangover to go with it. However, mine came with a bottle of EGB on the side instead. Elephant Ginger Beer is Sri Lanka’s soda weakness and the unmarked, recycled bottles come with a straw bobbing in the top as standard. 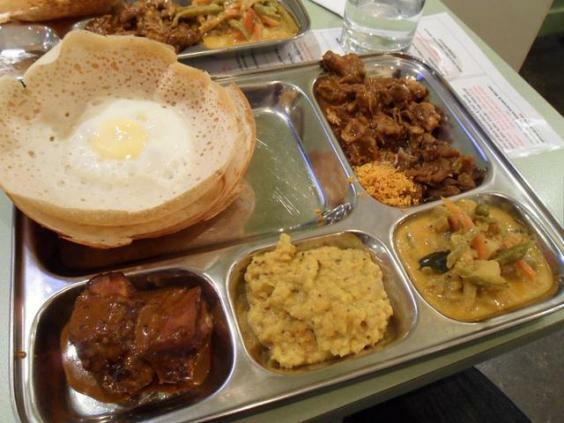 Sri Lankans love their hoppers – a pancake bowl served with either eggs in the morning or curries in the evening. Add your own sambols and chutneys and you’re away, having spent under 50 rupees (27p). The ratio of how crispy the pancake to how soft and gooey the filling is a debate as old as time – personally I’m all about the initial crunch and plenty of kick in the curry. Green Cabin is a traditional spot, Café on the Fifth a slicker, more modern addition. Hardly a surprise but samosas are perhaps the most ubiquitous snack on the streets in Sri Lanka. 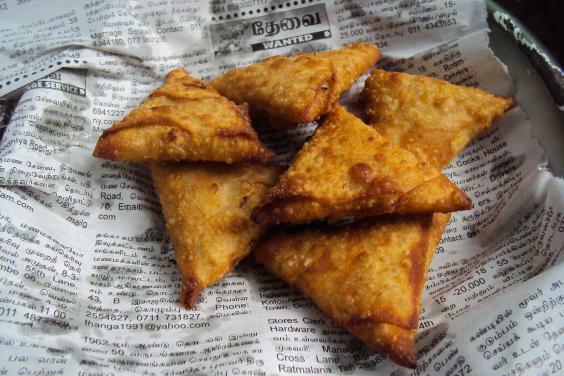 The little savoury triangles tend to be veggie or beef and loaded with plenty of spices. They were always lurking on the edge of my vision – every street corner seems to dish up their deliciousness. I found the smaller they were the tastier, as the ratio of crunchy pastry to meat was just right. There will always be a debate about who serves up the best, but Bombay Sweet Mahal (195 Galle Road) has been busting them out for years. Coconut is king in Colombo, from the bright-green balls fresh from the countryside piled up by the side of the road (all ready for me to slurp from), to saravita found on the promenade. 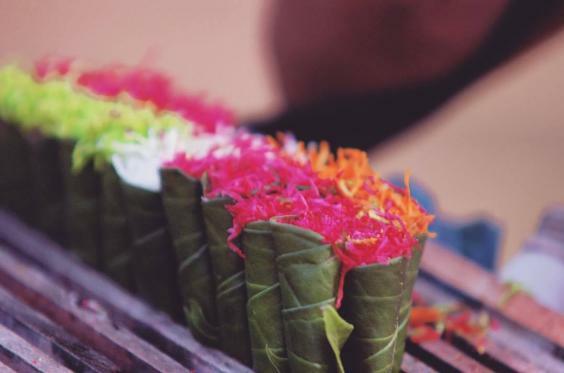 Saravita is a sort of street dessert – luminous-coloured, shredded coconut wrapped up in a betel leaf like a child’s treat. 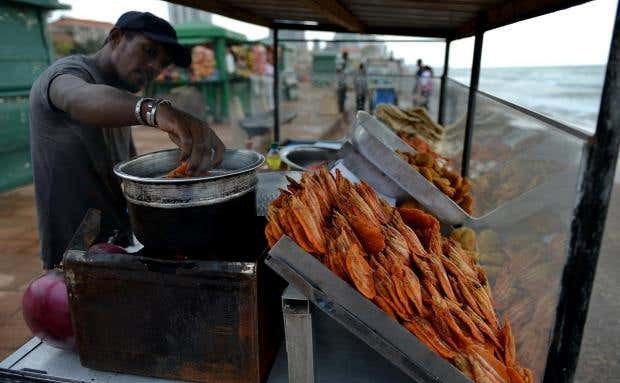 I came across lots of saravita hawkers near Galle Face Green, with trays of the snack hanging from their necks like old-school sweet sellers in the cinema. And like all great childhood “delicacies”, I could almost taste the saccharin colours, even in the dark.